I can count the number of times I’ve cooked turnips on one hand. Five fingers. Maybe four. It’s sad, but also exciting, when you realize you’re forgetting an ingredient in life that really deserves attention. Turnips, with their beautiful orchid-shaded skin, are highly underutilized in my kitchen. When finally tasked with a freelance assignment calling on this root veggie, I purposely bought more than I needed so I could do a little extra experimentation on the stove. I settled on this, a breakfast-for-dinner, which a novelty in itself, felt that much more so with the rarity of turnips. Eggs and potatoes are classic match made in heaven, but I must say, grated turnips make an equally fine partner. It’s one I hope to call upon more often. Here, they contribute an extra, pleasant punch of flavor while holding the similar texture and heartiness of typical hash browns. Their slight bite goes perfectly with fried eggs. From beer to chocolate to greens, I often like things on the bitter side. If you’re a little shy to this department of taste, consider going halfsies with the turnips and grate a russet potato or two into the mix. For an extra treat, pocket this in a pita, and top with a spoonful of spaghetti sauce – my solution for turning leftovers into a phenomenal new meal. Grate shallots and turnips, either with a hand-held grater, a food processor grater, or chop into thin, short strips. In large saute pan, melt 1 Tbsp. butter over medium-high. Add shallots and turnips. Season generously with salt and pepper. Sauté until turnips begin to brown, 5-7 minutes. Add kale, and stir until kale begins to wilt. Cook another 5-7 minutes, until kale is tender, stirring every so often to keep from sticking. Stir in mustard. Make 2 holes in the pan. (If cooking 2 eggs per person, you may need to cook 2 eggs separately, depending on the space in the pan). Divide remaining 1/2 Tbsp. of butter between each. Crack eggs into each hole. Season with salt and pepper. Use a spoon and spatula to flip when bottom is set. 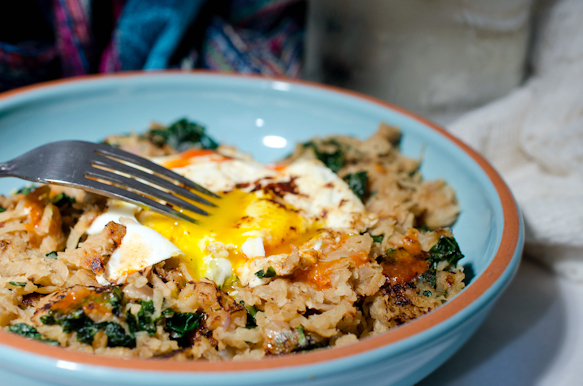 Divide turnip hash between three plates and top with the eggs. Serve, drizzled with a dash or so of Cholula, if desired. *For an extra treat, pocket this in a pita, and top with a tablespoon or two of spaghetti sauce. For an extra treat, pocket this in a pita, and top with a tablespoon or two of spaghetti sauce. hmmm I think I have cooked turnip once…it was in one of those ‘winter vege soup packs’ they sell at the supermarket during uni! I do enjoy turnip mash though! If you like bitter foods have you tried bitter melon before? It is extremely bitter and is definitely an acquired taste. It is delicious in my eyes. I have never tried bitter melon. I’ll have to look that up! I presume I can definitely get that somewhere in Philly. Great. Do you recommend cooking with it or eating raw? Love your version of hash! The plain old potato rendition never got me excited, but this sounds so much more flavorful, and wholesome too. “Turnip For What?” These 5 Turnip Recipes | Move your Assets!